Bitcoin has taken the world’s technological space by storm since its invention in 2008, but did you know that the first ever cryptocurrency, Digicash, was founded in 1989? Interesting for crypto fans, but that is just the tip of the iceberg when it comes to bitcoin facts, mysteries and even conspiracies! The things you can buy with bitcoin for example: Did you know it’s possible to buy a trip to outer space? Did you also know that 3.79 million of the total bitcoins in circulation today have already been lost forever? There will only ever be 21 million bitcoins in existence ever so that’s a pretty big chunk already gone! Since bitcoin got started, over eighty percent of the bitcoins have already been mined. But, however, it’s not nearly finished. It is estimated that the rest won’t be completely mined for another 120 years or so. What’s the strangest thing you can buy using the cryptocurrency? Well, we can’t give it all away. 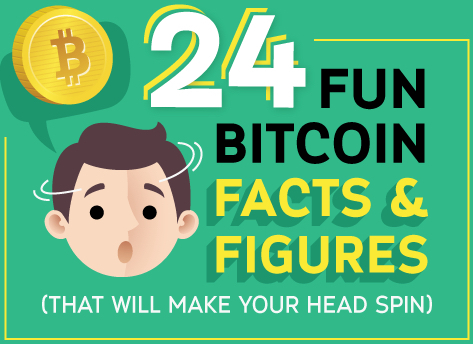 Read on with the below infographic which presents even more fun and interesting facts about Bitcoin. These fun facts are really interesting to read. I like how Satoshi stands for Samsung and Toshiba.